Note: This chart covers private sector employment only. Some states have laws that apply only to public employers, or have different rules for public and private employers. If you are a public (governmental) employee, consult a local attorney or your union to learn more about the rules and laws that apply to you. The overtime rules summarized are not applicable to all employers or all employees. Occupations that generally are not subject to overtime laws include health care and attendant care, emergency medical personnel, seasonal workers, agricultural labor, camp counselors, nonprofits exempt under FLSA, salespeople working on a commission, transit drivers, baby sitters, and other household workers, and many others. 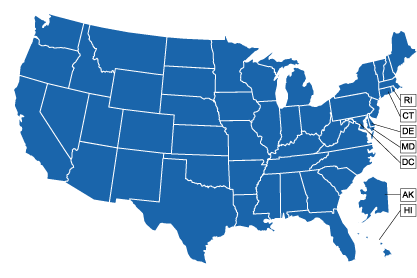 For more information, contact your state's department of labor and be sure to check its website, where most states have posted their overtime rules. UPDATE: On August 31, 2017, the U.S. District Court for the Eastern District of Texas granted summary judgment in the case challenging an Obama era overtime rule. The rule would have increased the amount an employee must earn to be exempted from eligibility for overtime pay. Under the rule, workers earning less than $913 per week would have been eligible for overtime pay. Currently, only workers earning less than $455 per week are eligible to receive overtime pay. The Department of Labor is still expected to increase the required salary level for exemption but it is not known how much the increase will be. This page will be updated as new information is received. Employment overtime laws apply to: Employers of 4 or more employees; commerce or manufacturing businesses. Notes: Voluntary flexible work hour plan of 10-hour day, 40-hour week, with premium pay after 10 hours is permitted. No overtime limits for private sector employers. Employment overtime laws apply to: Employers of 4 or more employees. Employment excluded from overtime laws: Employment that is subject to the FLSA. Notes: Employees in retail and service establishments who spend up to 40% of their time on nonexempt work must be paid at least twice the state's minimum wage ($572 per week). Time and a half after x hours per DAY: 8; after 12 hours, double time. Time and a half after x hours per WEEK: 40. On 7th day: Time and a half for the first 8 hours; after 8 hours, double time. Employment excluded from overtime laws: Computer software employees who design, develop, create, analyze, test, or modify programs using independent judgment, or who are paid at least $45.84/hour. Notes: Alternative four 10-hour day work week is permitted, if established prior to 7/1/99. 7th day premium pay not required when employee works no more than 30 hours per week or 6 hours per day. Employment overtime laws apply to: Employees in retail and service, commercial support service, food and beverage, health and medical industries. Time and a half after x hours per WEEK: 40; premium pay on weekends, holidays, or 6th or 7th consecutive day. Notes: In restaurants and hotels, time-and-a-half pay required for the 7th consecutive day of work or for hours that exceed 48 per week. Time and a half after x hours per WEEK: 40. Dairy, sugar cane, and seasonal agricultural work: 48 hours per week. Employment excluded from overtime laws: Employees earning guaranteed compensation of $2,000 or more per month. No state overtime rules that differ from FLSA. Employment excluded from overtime laws: Employment that is subject to the FLSA, movie theaters, seasonal camps and amusement parks, FLSA-exempt nonprofits. Notes: Collective bargaining agreements ratified by the NLRB may have different overtime provisions. Domestic service work is not excluded from overtime laws. Employment excluded from overtime laws: Retail, hotel, and restaurant businesses. Notes: 7th day, time and a half. Employment excluded from overtime laws: Auto mechanics, parts clerks, and salespersons; hotels, motels, and restaurants; canning, freezing, packing, and shipping produce and perishable foods. Notes: Employee cannot be required to work more than 80 hours of overtime in any 2-week period. Time and a half after x hours per WEEK: 40; 48 hours for bowling alleys and residential employees caring for the sick, aged, or mentally ill in institutions other than hospitals; 60 hours for agricultural work. Employment excluded from overtime laws: Agriculture, farming, fishing; hotel, motel, or restaurant; seasonal workers less than 5 months; hospital, nursing home, or rest home; public transit. Notes: Time and a half as overtime unless already paid that rate as part of regular compensation. Employment overtime laws apply to: Employers of 2 or more employees. Employment excluded from overtime laws: Employees not subject to state minimum wage laws. Time and a half after x hours per WEEK: 40; 52 hours for seasonal amusement or recreation businesses. Employment excluded from overtime laws: Employment that is subject to the FLSA; retail or service business with gross annual sales or contracts of less than $500,000. Time and a half after x hours per WEEK: 40; 48 hours for students working seasonal jobs at amusement or recreational areas. Employment excluded from overtime laws: Businesses with a gross annual sales volume of less than $250,000. Notes: Employer and employee may agree to flextime schedule of four 10-hour days. Employment excluded from overtime laws: Employees covered by the FLSA; employees in amusement, seasonal, or recreational business open 7 months or less a year. Employment excluded from overtime laws: June to September: Summer camps, conferences, and retreats operated by nonprofit or religious groups. Time and a half after x hours per WEEK: 40 for nonresidential workers; 44 for residential workers. Employment excluded from overtime laws: Same exemptions as FLSA. Time and a half after x hours per WEEK: 40; 45 hours a week in seasonal amusement or recreational establishments. Time and a half after x hours per WEEK: 40; 50 hours per week, cab drivers. Employment excluded from overtime laws: Computer professionals who design, develop, create, analyze, test, or modify programs using independent judgment or who are paid at least $27.63/hour. Employment overtime laws apply to: Employers who gross more than $297,000 a year. Notes: Time and a half required after 10 hours a day in canneries, driers, packing plants, mills, factories, and manufacturing facilities. Notes: Time and a half for Sunday and holiday work is required for most retail businesses (these hours are not included in calculating weekly overtime). Employment excluded from overtime laws: Retail and service businesses if 75% of annual sales not for resale; hotels, motels, restaurants; transportation workers exempt under FLSA. Employment excluded from overtime laws: Employees that are subject to the FLSA. Employment overtime laws apply to: Manufacturing, mechanical, or retail businesses; beauty parlors, laundries, restaurants, hotels; telephone, express, shipping, and transportation companies. This chart is a selection from Your Rights in the Workplace published by Nolo Press. For more complete information on this, and other job rights questions, order the book here.